Before you continue with this exercise, on a separate sheet of paper, make a list of four things that you think must happen for an event in your life to be considered significant. For example, I went down to breakfast this morning and had my morning coffee – not really an earth shattering event. While drinking my morning coffee and listening to the local news, I discovered that I had just won the lottery – that is a significant event because it could radically change my lifestyle. Would winning the lottery change the history of Canada? For an event to be considered of national significance, add two conditions that a nation would have to consider to determine if the event was significant. Keep this list in your notes as we will refer back to it. 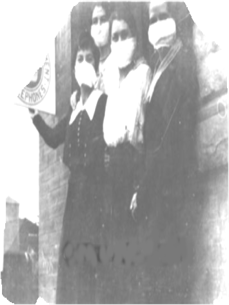 The Spanish Flu 1918 to 1919 The Spanish Flu epidemic of 1918 -1919 killed an estimated 50,000 Canadians in just over nine month or, 1 in 6 Canadians were affected. In all four years of the WWI a total of 67,000 Canadians had been killed. How would you cope under the conditions of a pandemic? event because it could radically change my lifestyle. Keep this list in your notes as we will refer back to it. The Spanish Flu epidemic of 1918 -1919 killed an estimated 50,000 Canadians in just over nine month or, 1 in 6 Canadians were affected. In all four years of the WWI a total of 67,000 Canadians had been killed. How would you cope under the conditions of a pandemic?